The Girl Who Disappeared Twice by Andrea Kane, a Mysterious Review. 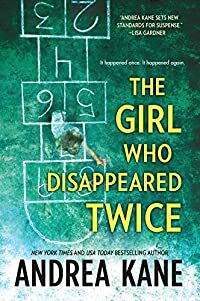 Review: The disappearance of a 5-year-old girl prompts her parents to contact Forensic Instincts, a company that employs specialized people working on the edges of the law, to assist in her safe recovery in The Girl Who Disappeared Twice, a novel of suspense by Andrea Kane. Krissy Willis is the daughter of Family Court Judge Hope Willis and her husband Edward, a prominent defense attorney. Her abduction from her school was a model in professional efficiency. Though law enforcement officials from several organizations are promptly on the case, Hope insists — against the advice of her husband — on also calling Casey Woods, the head of Forensic Instincts. The company employs only a handful of highly trained individuals, experts in their respective field, their methods unconventional but usually successful. A third party is also involved, a retired police officer, who notes that many elements of Krissy's kidnapping are remarkably similar to an unsolved case from 30 years ago, and believes there may be a connection. Though everyone is promising cooperation, there's a risk that with so many parties involved, something will fall through the cracks, risking not only Krissy's safe return, but her life as well. The Girl Who Disappeared Twice is an exciting novel of suspense with a remarkable cast of characters. Of particular note are the members of Forensic Instincts, who may seem esoteric, even odd, at first, but who work together seamlessly as a team. Their presence takes a rather ordinary kidnapping story and elevates it into an extraordinary investigative tale. Add to this an interesting, complex drama involving an otherwise successful family that may be hiding a skeleton or two in the closet, and the result is a book that is very hard to put down once started. Though not indicated as the first in a series, Forensic Instincts is such a fascinating group of investigators that readers will almost certainly welcome another case for them. Special thanks to guest reviewer Betty of The Betz Review for contributing her review of The Girl Who Disappeared Twice. Acknowledgment: Meryl L. Moss Media Relations provided a copy of The Girl Who Disappeared Twice for this review.